Unfortunately my computers main hard disk and back up drive have once again thrown up some SMART errors, that whilst thankfully are non-fatal, have sent me into a flurry or backing everything up. This got me thinking about all the hard disks I have floating around in my collection and so I decided to dust them all off and take some photos of the more interesting ones. First up are two MiniScribe MFM hard disks from the early days of PC computing. The one on the right shows the common use of stepper motors to move the heads in early hard disks, the other may be one of the first to use voice coils, we can’t tell from the outside. MiniScribe as a company is famous for how they went out of business. They were running low on funds, but wanted to make everything look good on paper, so they sent out a bunch of bricks instead of hard disks to some customers who were in on it. They laid off some staff involved shortly after, who of course went to the papers and of course the rest is history. A rival company Maxtor ended up buying their intellectual property. 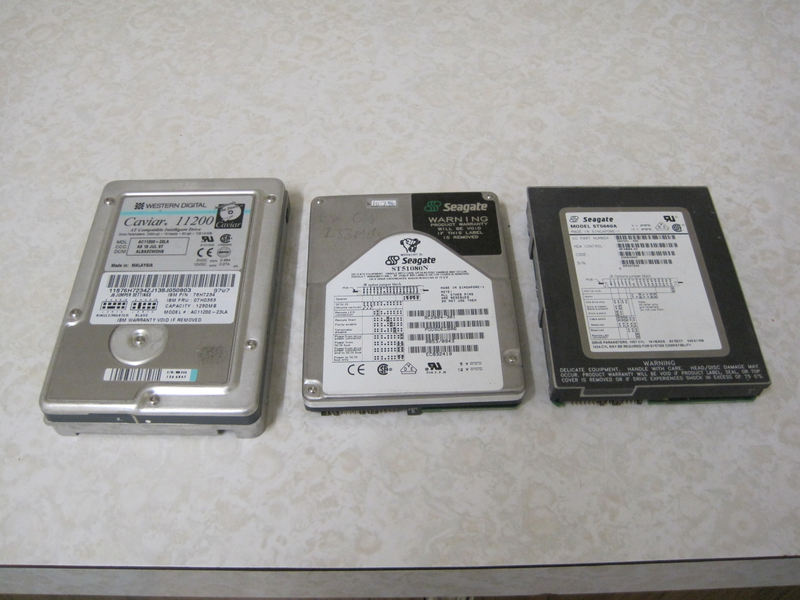 The second group here are all full height 3.5 inch SCSI drives, all around the 200MB capacity. In the back left is a Conner cp3200F, a drive that came out of a 486 we had in my late teens, as far as I know it still works. At the back right is a drive made by Digital (Digital Equipment Corporation), this would have most likely been in one of their computing products of the time like a vax station. It may actually be a re-badged drive from another manufacturer such as Conner. You’ll notice they both look very similar. Also in picture is an old Quantum ProDrive 210S and a Maxtor LXT213SY. 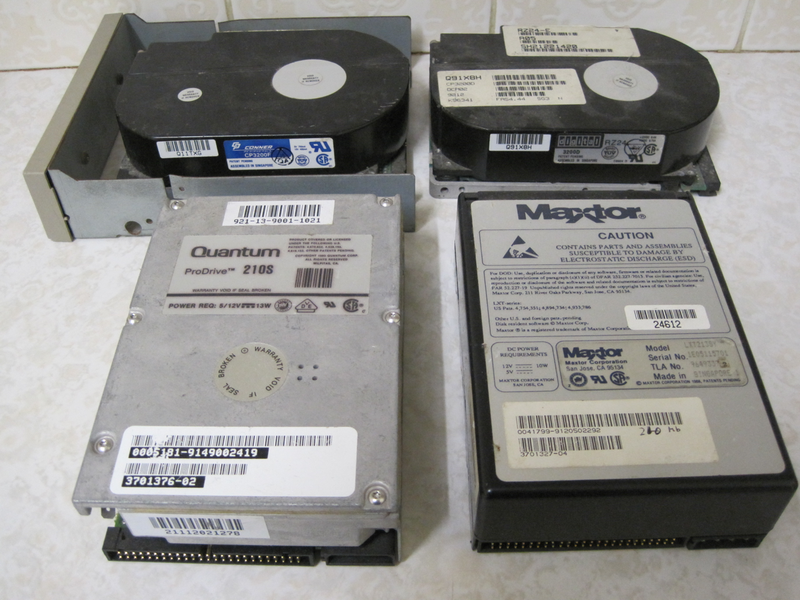 Here we have a Quantum ProDrive LPS SCSI drive (top) that was very common in early Macintosh machines. I had heard that these drives had a problem where the lubrication in the spindle was too stiff for it to spin up until warm. Users were instructed to try to jolt the machine in such a way as to loosen the grease and start the drive. I guess they could have also warmed it up by some means. The story sounds a bit fanciful, but I didn’t use machines with these drives so I don’t know how true it is. The drive on the bottom left is a Seagate ST31055W SCSI drive that is quite a bit more modern. Drives like it were frequently used in commodity PC servers in the early 2000’s. 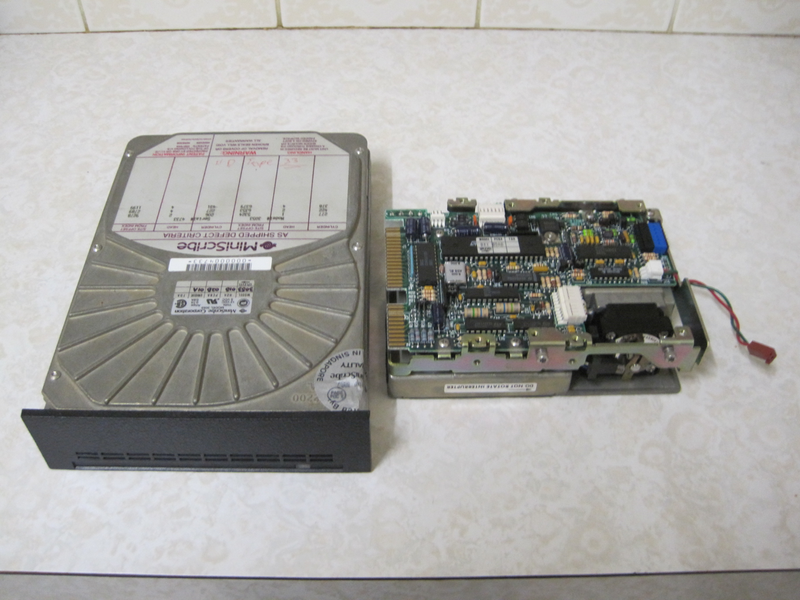 The drive on the right is a fujitsu MAN3184MC SCSI drive with an all in one connector. This connector was commonly used in more high end equipment and was frequently found in Sun machines. My old Sparcstation 20 will accept these drives and it was developed in 1992. This type of drive didn’t fall out of favour until SAS became the norm for servers, many servers currently still running are using these drives. I’m lucky to have a number of these drives spare including four 10,000 RPM HP drives of this type. Two of these drives are remarkable in the form factor they seem to fit in. 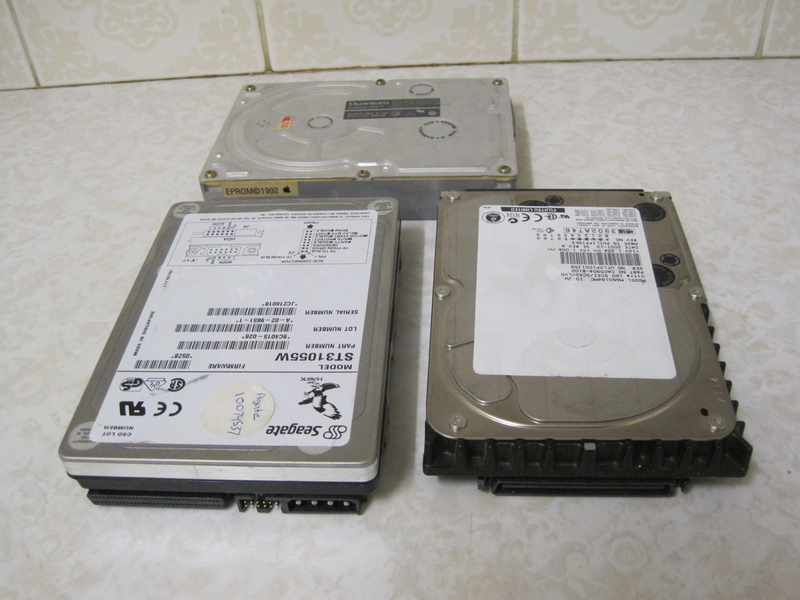 Both are Seagate drives, a ST51080N and a ST5660A, which are about 1GB and ~500MB in size respectively. You can see that they are both significantly smaller than the Western Digital Caviar drive, which is about the standard size for most 3.5 inch drives today. The Western Digital drive is a Caviar 11200 10G disk, and as such is younger than the other two. It seems to have an IBM sticker on it, so at some point it came out of an IBM machine. 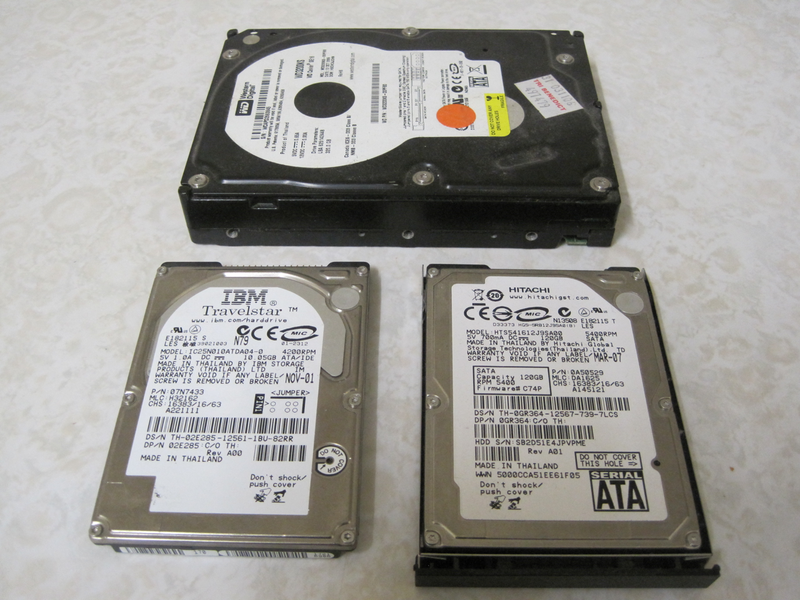 The last three drives are somewhat more modern than the rest, two are laptop drives which are an IBM TravelStar and a SATA Hitachi 120G drive. Both are pulled out of laptops from when I was working in IT support. The third drive is a Western Digital WD3200KS drive which is SATA and 320G. This used to be my main drive for a time until it developed bad sectors and got retired. I keep it pretty much only for nostalgia and the fact it has a nice backup of my system on it from the time it died. Whilst it was purchased in roughly 2006, it is a good physical representation of what modern drives look like today. This concludes the photo tour of the mostly retired hard disks of my collection. In the time it’s taken me to prepare this post, I’ve managed to run the Western Digital tool on my main disk, and it is now looking healthy again without any data loss. I’ll still need to replace it sooner or later as errors like this are often indicative of more arriving soon. The backup drive is looking distinctly much less healthy, but at least it wasn’t storing anything more than a backup, so I’ll simply replace it when I get some money. I’ve found it interesting that the older drives I have are more reliable than my modern equivalents, some of the old ones still work with no bad sectors, and I’ve put them to use in my Sun machines. Most however are untested. I’ll be keeping all the older drives as they have historical value even if they don’t work. Some like the small Seagate IDE drives I picked up simply because of the small form factor and are in my collection mostly as a curiousity. I also have a bunch of modern hard disks that are untested, but are frankly mostly unremarkable, so I may dispose of them if I need space. They might become a good source of strong magnets. It’s starting to get quite warm in my part of Oz, so I’m running a bit late on today’s post as my brain requires a bit of cool to function properly. In the warmer weather here I often find it difficult to do anything that requires too much thought or fast reflexes, so I often favour either slower games with some strategy elements or games that require little thinking. Because I grew up in a place that got to 40 degrees even in the shade, I find that summer is often time for lazy afternoons in front of a computer playing a good game. On the DOS machine I often revisited favourites such as Civilization, Silent Service, F117a or Hocus Pocus. Today’s game is not one of my favourites, but is one I played back in the day on our DOS machine. It is called Stellar Defence II and was released by Locatha Industries back in 1993. We got the shareware version on a cover disk from a magazine my older brother used to buy. 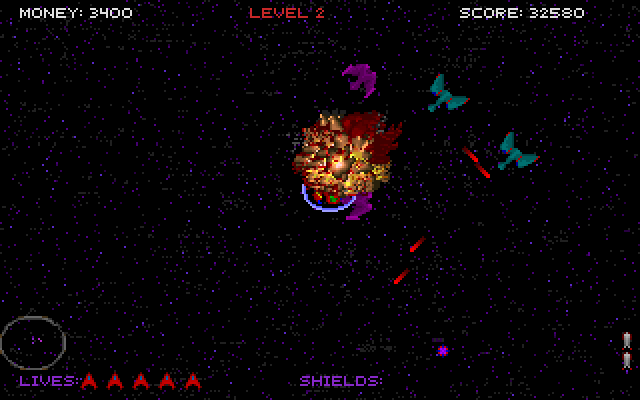 The game is a shoot ’em up style game with a asteroids style control scheme and a 360 degree scrolling background. 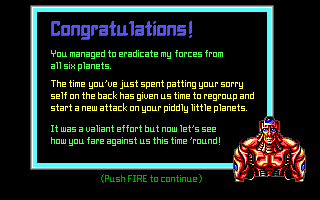 Apparently you are a Lagarian fighter pilot trying to save the galaxies from the Yarien invasion force. As with pretty much every other shooter it’s up to you to defeat the ravening hordes. The games graphics are at first very impressive in some ways, especially the logo screens for the companies responsible. The rest of the VGA graphics look a bit amateurish in places. The main sprites look fine for what they are, but the ones that were created using a ray-tracer look very shiny and toy like. This is especially evident in the star base animation. Also, it appears that the graphics code is poorly optimized as the game slows down badly when many objects are on screen. It seems worse with larger objects. There is support for many different types of sound hardware of which I was able to test PC speaker and Sound Blaster. The sound blaster would be a much better device if not for the annoying high pitch sound that seems to come from the device. This could be because I was running under Dosbox instead of my native hardware, but that seems unlikely. The PC speaker sound is again ok, but certainly not the best I’ve ever heard. The game play is sort of asteroids like in the way you move your ship, and that there are waves of asteroids to destroy. Some levels are instead filled with a number of enemy ships that are intent on killing you. The enemies are quick and like to charge directly at you firing a hail of bullets in the process. Unfortunately because of the controls it is very difficult to maneuver out of the way and shoot back. I found it nearly impossible to beat the waves of ships without losing a life. If you manage to fight your way far enough you will arrive at a star base where you can buy upgrades to your weapons and extra lives. It is important to make sure you have enough bombs and lives as these are what you’ll go through the most. The game speed unfortunately seems to vary depending on whats happening on screen which can make things very frustrating. When the game is incredibly slow it is difficult to play as it becomes more slide show like, and when it runs quickly I find I often overshoot turning and moving as the controls become too sensitive. You can try and avoid this by changing the delay setting before playing. I remember enjoying this game much more when I was a youngster playing this on the old 386, but unfortunately I don’t think it has stood the test of time like many other DOS games have. Looking at it now it seems like the game may have been the first for the company, and from what I see online perhaps the only one they released. Perhaps everyone involved was simply inexperienced, with time and polish it could have been quite good. Dial up internet used to be the main way people connected up until the early 2000’s in Australia. So it was only fitting that one of the most popular brands of modem were made by an Australia company known as Banksia. 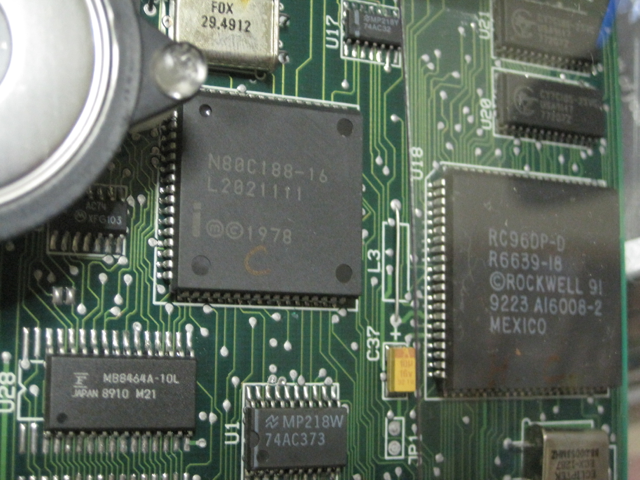 Like many other manufacturers they frequently used the Rockwell chipsets as integral parts of their modem design. One of these and probably the most ubiquitous type of modem was the Bit Blitzer. Banksia later merged with or bought many other modem manufacturers including NetComm, and became Sirius Technology, they continued to operate Banksia, NetComm and the others as separate brands. There are three major types of modems, the old school serial modems, HCF and HSF modems. The old school serial modems did all the processing on behalf of your computer and often were controlled using a simple protocol called the hayes protocol. The benefit of this is drivers were pretty much not necessary, so they often worked very well with very little effort. The Bit Blitzer is one of these. HCF modems are host controlled which means the computers CPU had to do a large portion of the work determining line speed. HSF modems are basically software modems, the hardware is basically a sound card and all the work is done by the host CPU. Drivers for these types could seriously affect the quality and speed of connection, and they frequently dropped their connections, partly because the CPU would sometimes be busy doing something else. Late USB style modems often fit into this category as well as most PCI modems. Back at the start of university, living in college we didn’t have the ethernet ports and wireless that is commonly found today. I used an internal HCF type modem to connect to the university internet, but a friend of mine used a 36K Bit Blitzer. His internet connections were usually more stable than mine were despite having a older modem. I later bought an external serial modem so I would have better connectivity. In these early days in college we often used our modems to connect our PC’s directly in order to be able to play some of our favourite games multiplayer, and to transfer files. Doom was often a favourite. We usually used hyper term to transfer files, but sometimes we also used laplink software as this meant we could chat whilst the files transferred. 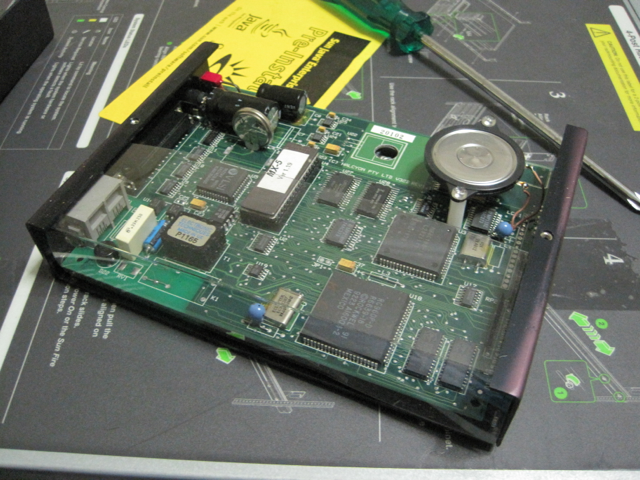 This weekend I took apart and photographed the Bit Blitzer modem I have in my collection of junk. It’s not in very good condition as I rescued it when I worked in IT support. It appears that the voltage regulator attached to the chassis doesn’t have good connections so there may not be very much wrong with it. 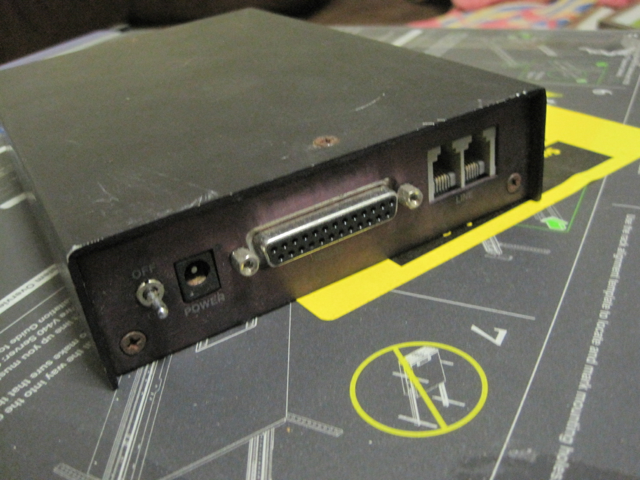 This one has a Rockwell chipset like most other modems of the time but interestingly has an Intel micro controlling it. This must have taken ages to draw! 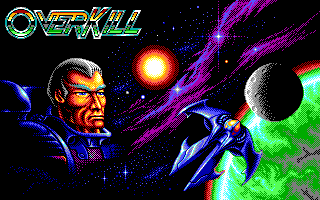 Overkill is a shoot ’em up game made by Ste Cork back in 1992. It was the first vertical shooter released by Epic Megagames at a time when they were at the height of competition with Apogee. Like many other PC games of the time the game supports older technology in the form of CGA and EGA graphics, even though VGA was very common at the time. I originally played the shareware version of the game from a magazine cover disk shortly after it came out. I thoroughly enjoyed the game, and unfortunately because of being a kid and poor wasn’t able to get the registered version. Fortunately the author was kind enough to make the registered version freeware quite some time ago. I don’t know why more authors of DOS software don’t do the same thing, but I guess they must have their reasons. It would be nice if they’d port the games to modern devices, but that’s a rant that’s completely off topic. As I said before the game has EGA and CGA graphics available, which are both very impressive in terms of both speed and artistry. Dithering is used very effectively to draw complicated parts of the user interface and the sprites. There are few EGA games that look this nice. Another contemporary game called Major Stryker whilst it has better technical graphical features, it doesn’t make effective use of dithering as much as this game. I’ve also noted whilst playing that the animation is quite well done, it’s smooth and plays well on the kind of machine I had at the time. The sound mostly comes from the PC speaker, and sounds quite good. This was quite handy for us on our old machine as we didn’t have a nice sound card. It also has the option for Adlib music which is good, but there is only a few songs from what I can tell. They aren’t intrusive so they are unlikely to get annoying if you hear them repeatedly. The game play is pretty much your standard shoot ’em up style, but with a few small differences. Firstly you can choose which weapon power ups you want to use. You do this by pressing the choose key once the power up you want is currently available. Each time you pick up the weapon power up the game cycles between four different types of improvements, you just have to wait until you’ve got the one you want then press the button to use it. There are a few weapons that seem to help me out more than others. I’ve found for the guns, simply having the first power up, the double shot, is one of the most effective weapons you can have. The contour missiles are another must as they take out enemies nearby that you couldn’t otherwise get. I also like the yo-yo missile which is pretty unique. It is a seeking missile that goes out attacks a enemy destroying it, then returning to your ship so it can make another run at another enemy. This is extremely useful and is sensibly time limited as this could be over powered if you had it permanently. Like many other shooters you can get side arms, a fire nose and drones to add more fire power to your ship. Unlike other games these extra parts can be destroyed if they are hit by enemies or the surrounding terrain. You can also upgrade you ship to a fighter or eventually a battle cruiser. This affects how well the ship handles as well as how strong it’s shields are. This can make some of the tighter areas on some levels more difficult. The Wikipedia page for Overkill says that it was quickly overshadowed by some other games such as Raptor, Tyrian, and Major Stryker. Two of these were released several years later, so I don’t personally consider them to be in the same generation as Overkill, so that statement is a bit sketchy. Still Overkill is not a well known DOS game, but it is certainly one of the hidden gems of its era. Rick Dangerous II was released in 1990 following the previous game the year before. It was quite popular on platforms such as the Amiga, Atari ST and the older 8 bit computers it ran on. It was also ported to the PC where it didn’t seem to be as popular. I got the game along with the first one from a good friend of mine from high school. It was quite some time after it’s release in 1997. I still played it anyway and found it enjoyable, but slow to play. The game was released at a time when the top of the line PCs had 386 processors and VGA, but many people still had old XT or AT systems that they didn’t want to upgrade because the machines were still quite expensive. The Amiga and other systems that were around at the time were far superior to the old XTs and ATs, but roughly equivalent to many 386 systems in 1990. They made the DOS port compatible with as many PC systems they could. Rick Dangerous II supports both CGA and EGA/VGA graphics, although I suspect the latter is just EGA as VGA was backward compatible with EGA. The game also has the choice of both Adlib and PC speaker sound, although I couldn’t get the Adlib sound working under Dosbox. The graphics and sound are good for the PC on each of the different devices, but don’t hold a candle to most of the other ports for other systems. The closest visually/aurally is the EGA and Adlib combination, but for some reason using EGA halves the speed of the game-play. I suspect this is because of badly optimised EGA code slowing the game down, but I can’t be sure. Rick Dangerous games are known for their brutal difficulty, requiring players to memorise the levels and play through them repeatedly before being able to beat a level. The PC version seems to pretty easy to me when played on the EGA mode, mostly because it’s so slow. This is one of the few occasions I’d recommend playing the CGA mode as this makes the game more challenging and closer to what it was intended to be. I did eventually play the whole game through on an older machine we still had around, and it was quite fun. But it’s not really a shining example of what PC games of that era could do. It is a pretty good port of the game in the context of the old XT/AT machines, but really the EGA/VGA could have been much better.